Church Sign Sayings: You Gotta Read This! You likely see one or more church sign sayings every week as you drive to and from your job and your multiple errands around town. Some are cute, others a little quaint, but every once in awhile, you spot a really great one! It might be inspiring, or thought-provoking, or humorous - but if it caught your attention, it served its purpose. Now, if you'll just remember to apply it and share it! Following are some good church sign quotes that are both clever and thought-provoking. * Without the Bread of Life, you are toast! * If God had a refrigerator, your picture would be on it! * Life is God's novel - let Him write it. * God wants full custody - not just weekend visits. * You are called to be fishers of men - you catch 'em, but then let God clean 'em! * Prayer is wireless access to God with no roaming fees. 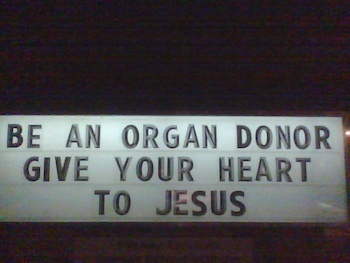 * Be an organ donor - give your heart to Jesus. * Jesus - your get out of Hell free card. * Forbidden fruits create many jams. * Honk if you love Jesus - text while driving if you want to meet Him. Share Your Church Sign Messages! What are your favorite church sign messages? Please share them with the rest of us! Enter your church sign sayings below (include a picture if you have one) and we'll all enjoy the inspiration. Have A Great Church Sign Message To Share? Your church sign message will appear on a Web page exactly the way you enter it here. You can wrap a word in square brackets to make it appear bold. For example [my story] would show as my story on the Web page containing your quote.